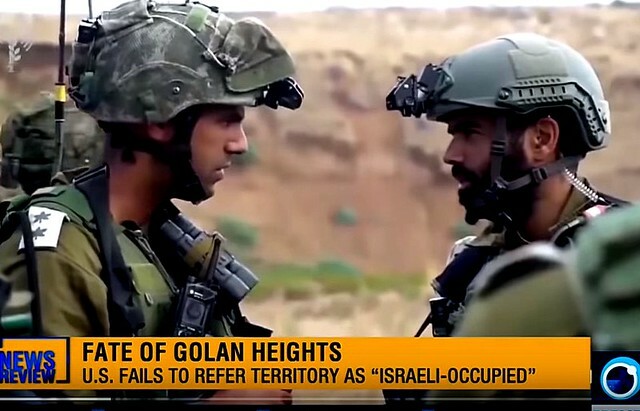 The US State Department has changed its usual description of the Golan Heights from “Israeli-occupied” to “Israeli-controlled”. The change in terminology has come in an annual global human rights report released on Wednesday. A separate section in the report, on the West Bank and the Gaza Strip also did not refer to those territories as being occupied or under occupation. Further, U-S Senator, Lindsey Graham, has said he will make efforts to make the government recognize the Golan Heights as part of Israel. Tel Aviv has also been lobbying U.S. President Donald Trump to recognize its sovereignty over the territory. Israel occupied Syria’s Golan as well as the Palestinian territories of West Bank and Gaza Strip in 1967. This entry was posted in Imperialism, Israel-Palestine-Gaza-Occupation, Oil and/or Fossil Fuels, Politics, Russia, Syria and tagged Crimea, David Yaghoubian, Finian Cunningham, Golan Heights, Lindsey Graham, Richard Silverstein, Same As It Ever Was, Ukraine. Bookmark the permalink.